Zen Canyon Paragliding was a 2 week long project collaboration during the course Building Virtual Worlds. Alex played the role of texture artist, producer, and interaction designer. The game hinges around the player’s use of the paragliding apparatus as an immersion-building component and control tool. 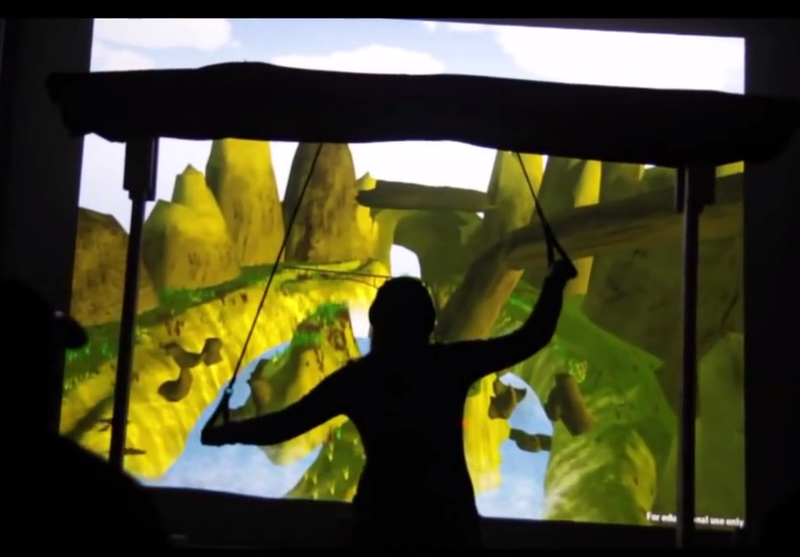 While the game uses the Kinect for Windows, the player pulls down on the paragliding steering cords in order to turn. The use of the apparatus serves to build off the player’s natural control language, so that even though players might not have gone paragliding before, a very simple set of instructions serve to clarify how to navigate the world. The game world is also designed to aid non-native gamers. Our task for this assignment was to build a game that naive users could play the first time and win- many of whom have no experience with virtual worlds whatsoever. In Zen Canyon, the constant wind pulls players in the right direction through a series of branching and then converging path options. For this piece, our team was awarded semi-finalist position in the Adobe Design Achievement Awards in the installation category. 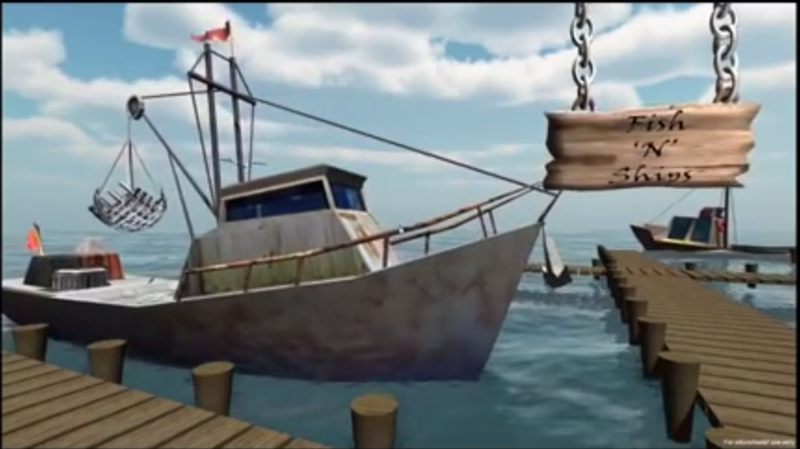 The Fish & Ships game was produced over the course of a single week by a team including Alex, 2 Programmers, and a 3D Modeler. Alex filled interaction design role, producer, and texture artist. The core experiment in Fish & Ships is to test a new interaction style- that is, how can Natural User Interfaces (in this case, the PSMove) be integrated into a larger, multiuser environment? Additionally, what novel opportunities exist for multiuser interactions built around teamwork and collaboration? Previous BVW (Building Virtual Worlds) projects have experimented with crowd control techniques and technologies, and Fish & Ships takes a similar approach to a point. Where it diverges is in treating the audience as a single superorganism, in which individuals have more or less control and impact during different periods of gameplay. This is achieved by having players pass the PSMove between each-other in order to keep their school of fish alive. As fitting with the theme of the game, teamwork is necessary for survival. The fascinating thing about playtesting was that players didn’t actually need to have or hold a controller in order to feel agency within the game; in fact, simply by encouraging other audience members who held the PSMove to pass it elsewhere, players found enough reward to want to “play again”, even though some didn’t even touch the controller at all during the initial period of play.